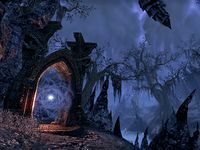 The blue fluid found everywhere in Coldharbour is called Azure Plasma, and is unformed "chaotic creatia," the stuff from which all Oblivion matter is formed. When a Daedra is "killed," its morphotype, or vestige, gradually forms a new body by accretion of Azure Plasma. 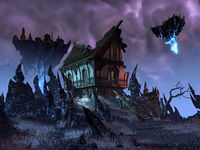 The Village of the Lost is a plane containing three villages trapped between Coldharbour and Mundus. It consists of islands primarily connected by portals. The central island is named Ruins of Silver Run, and contains portals to the two floating islands. Ruins of Khaj'yahai is the western floating island, while Ruins of Dushnikh's Shadow is the eastern one. 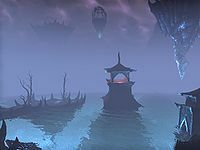 Island of the Damned can be reached from Khaj'yahai, and the portal to Island of the Lost is found in Dushnikh's Shadow. The other islands can all be reached by swimming, but Slaughterfish can pose a problem. The island containing Dushnikh's Shadow Longhouse is located in the far northeast. The Subterranean Cavern entrance can be found at the base of the volcano to the north. Village of the Lost Objective: Discover the secrets of the lost villages. Village of the Lost Group Event 50 Defeat Zatalguch in the Village of the Lost. Defeating Zatalguch in the Subterranean Lair will earn 1 Skill Point. 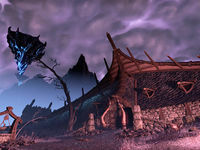 Khaj'yahai and Dushnikh's Shadow were originally named Khajiit Village and Orcish Village respectively.